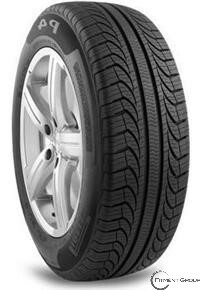 Developed for drivers of coupes, minivans, and sedans, the Pirelli P4 Four Seasons Plus tires are environmentally friendly all season options. The P4 Four Seasons Plus combine classic good looks with comfort, low noise, and reduced rolling resistance so that drivers are guaranteed the most comfortable ride possible. Created with a long life effect and enhanced four season traction in mind, the P4 Four Seasons Plus guarantees improved traction not only on dry roads but on slick wet, and even icy or snowy roads as well. The P4 tires have a unique silica-rich tread compound that is molded into a symmetric pattern for quick response handling and increased grip in treacherous conditions. For improved longevity, Pirelli designed the P4 Four Seasons with optimized casing and an internal structure of reinforced steel belts with wrapped nylon.